You will be given a Free reference e-book to read which has 776 pages And the test will be based on that e-book. CCNA security which stands for Cisco certified network associate security refers to a kind of certification which is effective in validating the associate skills and knowledge mainly needed to provide the highest level of security for Cisco networks. This certification also works in representing the skills of a network professional when it comes to developing a network security infrastructure, mitigating security threats and recognizing vulnerabilities and threats that often affect networks. It should be noted that the present curriculum for CCNA security actually emphasizes the core technologies currently used in network security, steps and procedures to install, troubleshoot and monitor network devices as a means of maintaining availability, confidentiality and integrity of devices and data and the competency of the different technologies used by Cisco for its security structure. It is also important for you to note that the training which is often provided to aspiring CCNA security certification holders is presently in great demand. Lots of successful and highly reputable companies in the IT industry use this certification as a global standard so receiving a certificate in this field can definitely benefit you. 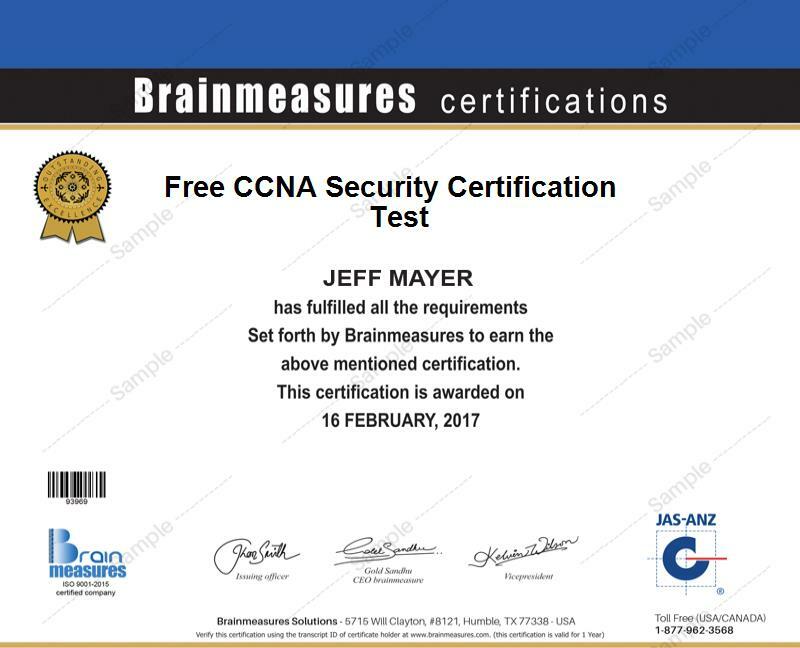 Fortunately, you can now easily deal with the challenges associated to taking and answering the CCNA security certification exam with the free CCNA security practice course available at Brainmeasures. It allows you to obtain high quality information about the field and hone your skills and expertise in the area through the free study guide and practice test included in the practice course. The free CCNA security certification practice course which is now available at Brainmeasures serves as your ticket towards reaching your aim of becoming a certified network associate security professional. With the comprehensiveness of the free study guide of this free CCNA security practice course, it would be easier for you to acquire the most accurate and high quality information about network security. This extensive CCNA security study guide works in supplying you with high quality, updated and correct information about how you can secure a network, the basics of building the most secure network infrastructure and the many things that you can do to instantly detect threats and vulnerabilities. The free practice test which is included in this practice course from Brainmeasures also aims to let you know what you can exactly expect from the actual certification exam so you have greater chances of passing it. How to effectively configure AAA and secure the network’s router? How to effectively implement endpoint security? How to explore the most secure voice solutions? The free CCNA security certification practice course which is now made easily accessible by Brainmeasures aims to help anyone handle the stress and challenges usually associated to taking the CCNA security certification exam. This free practice course can be expected to work more suitably for aspiring and existing network security administrators, network security support engineers, network security specialists and other professionals who are responsible in boosting the level of security when running different types of networks. You will also enjoy the fact that earning a CCNA security certification lets you enjoy more financial stability. Holding a certificate in the field can help you get the position of a network security specialist which usually offers an annual salary within the range of $55,000 to $105,000. You will also enjoy working as a certified network security associate since this lets you earn around $83,000 to $142,000 yearly.